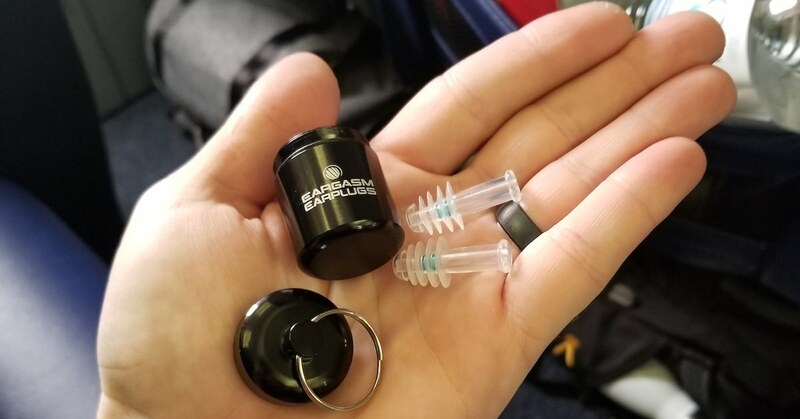 I recently had the chance to test out new aviation earplugs designed to reduce the pressure in your ears while flying and I have to say that I’m impressed! These new earplugs are made by Eargasm, one of my favorite earplug companies known for their amazing high-fidelity earplugs that lower the volume of your environment while still allowing you to hear music and conversations clearly. But today, I want to talk about their new aviation earplugs because flying can present a huge challenge for tinnitus and Meniere’s sufferers. Between the unhealthy foods sold in airports, the stressful nature of a long day of travel, and the changes in atmospheric pressure while airborne, there are a lot of factors that can cause problems. During flight, airplane cabins are pressurized, but only to about 6000-8000 feet above sea level. And depending on where you off from, that can add up to a significant and rapid change. Showing off my new earplugs to baby Zack on his first flight! If you’ve flown before, you how much take offs and landings can affect your ears. Ear fullness, popping, and pain are all common because the air pressure in your inner ear doesn’t change as fast as the air pressure of the cabin, causing the eardrum to swell inwards or outwards. 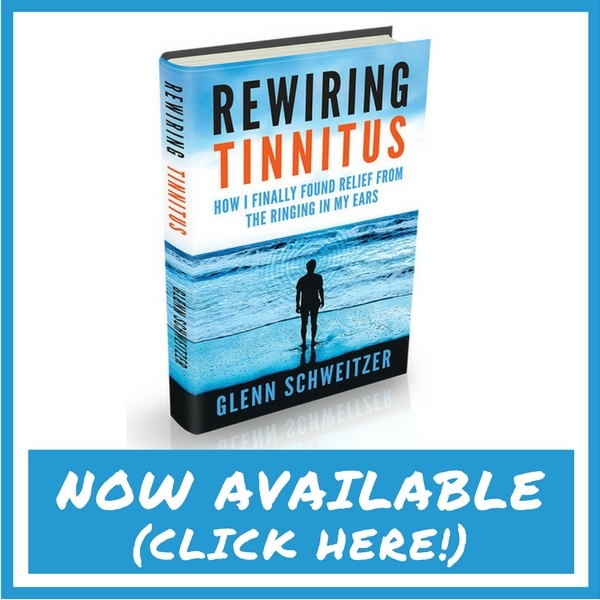 It’s entirely possible to equalize the pressure in a variety of ways but when you live with tinnitus, Meniere’s disease, or other vestibular disorders, these pressure changes can be far more problematic, especially if your symptoms are often triggered by changes in barometric pressure or weather. Now I want to be clear that barometric pressure changes are not one of my major triggers. Occasionally, a storm front rolling in will trigger a temporary spike in my symptoms, but it’s rare, and I generally don’t have problems equalizing the pressure in my ears when I fly. So when I tested these earplugs on two different flights, I focused on how well they equalized the pressure in my ears for me. And I was surprised at how well they actually worked. On both flights, the pressure in my ears remained equalized more or less the entire time they were in my ears. I also found them very comfortable and they worked really well as normal earplugs too, offering about 20 decibel noise reduction at the same time. Now this technology is not exactly new, a disposable version of this kind of earplug called Earplanes has been around for a long time. But Earplanes are only good for a few flights and don’t offer much in the way of noise reduction, whereas the Eargasm aviation earplugs are reusable and have a far more durable filter. Final Thoughts – Are they worth it? Are the Eargasm Aviation earplugs worth the money for tinnitus and Meniere’s suffers? I definitely think so and I recommend grabbing a set and giving them a try on your next flight. But it’s also important to know that cabin pressurization problems primarily affect the middle ear, rather than the inner ear, which is affected by Meniere’s disease, other vestibular disorders. So if changes in barometric pressure are a big symptom trigger for you, these may not give you level of protection you might be hoping for on flights. But you still will likely get some protection, and so in my opinion it worth giving them a shot. So I hope you guys give these a try! And if you’ve tried them already, be sure to leave a comment below! The one thing I was not able to test was whether or not these earplugs can help protect you against changes in barometric pressure when not flying, so if anyone else has these, please comment on this as well! NOTE: Eargasm was nice enough to send me a free pair of their new aviation earplugs to test out. I receive many free products (and purchase many products too) but only ever end up writing about a very small percentage of them that work for me and that I stand behind. Some of the links featured in the post are affiliate links. If you decide to purchase a product through these links, Mind Over Meniere’s may receive a small commission that goes toward the maintenance cost of the website. My First Eargasm (Earplugs) - High Fidelity Earplugs Giveaway! For sound reduction they were pretty much worthless. I wore them at work I wore them at a basketball game I pretty much wore them all day everyday I had them. To be honest I got more relief from the cheap foam ear plugs. Maybe it’s my condition or maybe I was sent a defective pair. I really wished they worked. The best part of the ear plugs for me was the aluminum waterproof container. Anyways love your channel and your efforts thanks again man. Hi Al, Sorry you didn’t get a good fit with the high fidelity earplugs. This is a problem with all earplugs like this available in a once size fits all product – if it doesn’t fit well, you won’t get the benefits. The best option is to have set of high fidelity earplugs custom molded by an audiologist. It’s much more expensive, but you’ll get a perfect fit that’s comfortable to wear all day, along with changeable noise reduction filters for different levels of noise. Have you tried the Airplane earplugs that I reviewed here as well? These just came out a few months ago. Similar experience with Eargasm plugs. Barometric changes trigger migraine and Meniere’s symptoms. I live in Chicago, with similar weather swings–and now, this Arctic blast. Like you, I get ear fullness, dizziness, and increased tinnitus, often accompanied by migraine. I’m curious, Al. Do you suffer from migraine, too? Or do you have accompanying head pain during a weather change? Hi glen. No I haven’t tried those yet. I haven’t flown since being diagnosed since one of my biggest triggers if not the biggest is change in barometeric pressure. I live in Cleveland Ohio and today for example is -18 with the windchill but by the weekend it will be 55 degrees. Big changes in the weather like this are my biggest problem. As long as I keep my diet in check and avoid any other triggers I can usually get away with just being dizzy with the ear fullness and loud tinnitus. Thanks again for doing the leg work for us dealing with Ménière’s. I have used Eargasm ear plugs twice while flying. I have very tiny ear canals and they worked well for me. I only use 1 because I have a tube in my Meniere’s affected ear. I swear by them for reducing/eliminating ear pressure while flying. Hi Linda. The only migraine or headache I get are sinus related. I do get ear aches when the fullness is bad. I do everything I can to keep my sinuses clean and drink lots of water. I started using CBD oil a year ago and it seemed to help so I tried smoking marijuana and have gotten great relief on when I’m having tough days. Hi, Glenn, Barometric Pressure and weather changes are a key trigger for me as far as tinnitus and Migraines. I recently took my first flight since diagnosed with Menieres and used Flare Audio Isolate aluminum ear plugs. Please go to their website or you can find them on Amazon. I highly recommend them. I also used them in a movie theater and loud music environment. However, it would be great if a discount would be offered to Menieres sufferers. I will try the ear plugs mentioned in the video. Thank you for your insight as I also used one of your suggested worksheets (Activity Planner) while traveling to stay organized and it was a great tool for the brain fog. Hi GiGi, I actually have a pair of those earplugs myself and have recommended them before! They are fantastic earplugs! Why Hasn't Anybody Heard Of Meniere's Disease? Meniere’s Bulletin: Cancer Update, CBD Deal, Searching for a Tinnitus Cure, & More! © 2015 Mind Over Menieres. Those who should not listen to the Symptom Relief Project include: Those who are prone to or have had seizures, epileptic, pregnant or wear a pacemaker, whether knowingly or not, should not listen the Symptom Relief Project. Those who should consult a physician before the use of this product include: individuals under the influence of medication or drugs. The Symptom Relief Project should not to be used while under the influence of alcohol or other mood altering substances, whether they be legal or illegal. Children under the age of 18 are to be examined by a physician for epilepsy or illnesses that may contribute to seizures prior to listening to the Symptom Relief Project, as they are more susceptible to seizures. Finally, DO NOT LISTEN TO THE SYMPTOM RELIEF PROJECT WHILE DRIVING OR OPERATING MACHINERY. Although the Symptom Relief Project’s aim is to contribute to wellness, it is not intended as a replacement for medical or psychological treatment. No medical claims are intended, express or implied. No statements made in the application or related documentation have been evaluated or approved by the U.S. Food and Drug Administration (FDA), and is not intended to diagnose, treat, or cure any disease. Do not stop taking any of your prescribed medication. The buyer/user of The Symptom Relief Project assumes all risks in the use of the Symptom Relief Project, waving any claims against Glenn Schweitzer and Mind Over Meniere’s for any and all mental or physical injuries. This includes all self-created suggestions for mood altering, brain wave states altering, and for self-improvement or motivation. The buyer/user also agrees to assume liabilities when other persons have access to the Symptom Relief Project. In no case will Glenn Schweitzer or Mind Over Meniere’s be liable for chance, accidental, special, direct or indirect damages resulting from use, misuse or defects of the audio, instructions or documentation.